Can we expect to being moving “in” to Spring today? Or 6 more weeks of Winter? The way it feels outside this morning, I think 6 more weeks of Winter, but we will just have to wait and see what Phil says! UPDATE: Phil and I agreed! 6 more weeks of Winter! BRRR! I hope I get some snow before this is all over! This entry was posted in The Holidays and tagged holidays, spring, winter on February 2, 2012 by jennifermichie. Very cute groundhog! Six more weeks of winter, and barely any snow here either. That is such a darling little picture; I love it!! 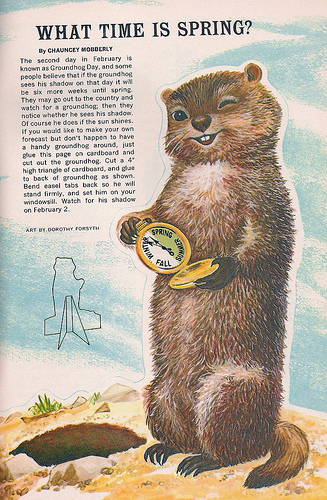 I think I’m going with the Canadian groundhog, too……MUCH better idea!!! Although, I have LOTS of ‘winter’ projects yet to accomplish; I better get going!! !